After doing a considerable amount of long overdue studio organization over the past few weeks, I have realized that space is not my primary issue. 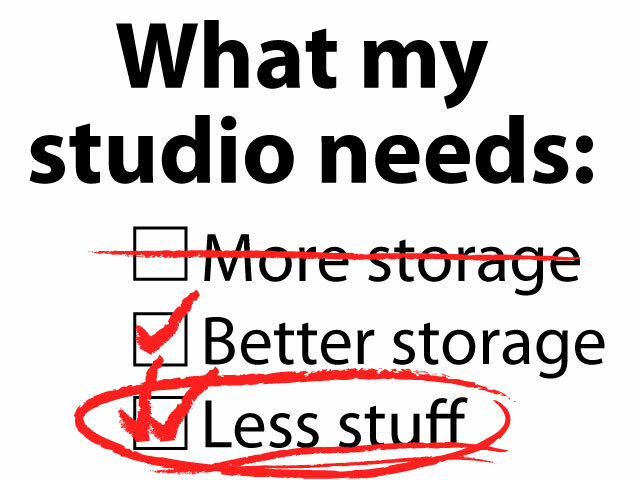 Of course, I could always use more, but there are other, more important (and more viable) considerations. Organization is a major difficulty. While my last studio was not terribly organized, I was still able to find almost everything because it was accessible. I did not have to dig around in shelves that were too deep or piled high with things that had no place. Pegboard was my friend. I also had sufficient horizontal workspace, thanks to a 16-foot long countertop that supported a sewing machine, a serger, and my oversized art printer. My current studio, while having no pegboard and lacking a 16-foot countertop, still has plenty of storage. I just need to organize it so that I can find and reach everything. Plastic bins help. My main enemy, however, is excess stuff. I’m not talking about fabric (although I have plenty of excess fabric) or art supplies (ditto, there), but the stuff that accumulates because I don’t know what to do with it. Old broken scanner? Can’t throw it in the trash because of e-waste concerns. Giant box for serger? Can’t get rid of that. Last sewing machine? It’s still there. I couldn’t find my Crayolas a while back because they were crammed into a box with a bunch of random junk. The result? I bought new ones. Now I have them all in a cookie tin, which I open periodically for aromatherapy purposes. Well, and to use them. There are other items that have proliferated in my studio because I couldn’t find them when I needed them: blue painter’s tape, seam rippers, cheap scissors, and small picture frames come to mind. My long-suffering husband and I will be hosting a super-bargain garage sale this summer, followed by a curb call and a dumpster pickup. The main purpose of this is to rid ourselves of the insane amount of old gardening equipment, plastic buckets, and scavenged fluorescent bulbs that the last owner “gifted” us when he left. There will be plenty of our stuff in there, too. The funny part about the garage sale scheme is this: we have to find a place to keep all this stuff until we sell it. This entry was posted in Art, studio and tagged Craft, Garage sale, organization, Perforated hardboard, postaday2011, sewing, storage, studio, Studio droppings. Bookmark the permalink.